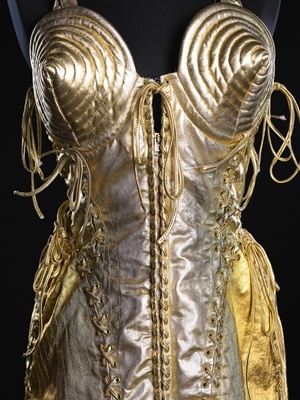 Since the late 1980s, Jean Paul Gaultier has enchanted the fashion world’s imagination with his witty and provocative attitude and humour towards fashion and sexuality, earning himself the notorious nickname l’enfant terrible of the fashion world. 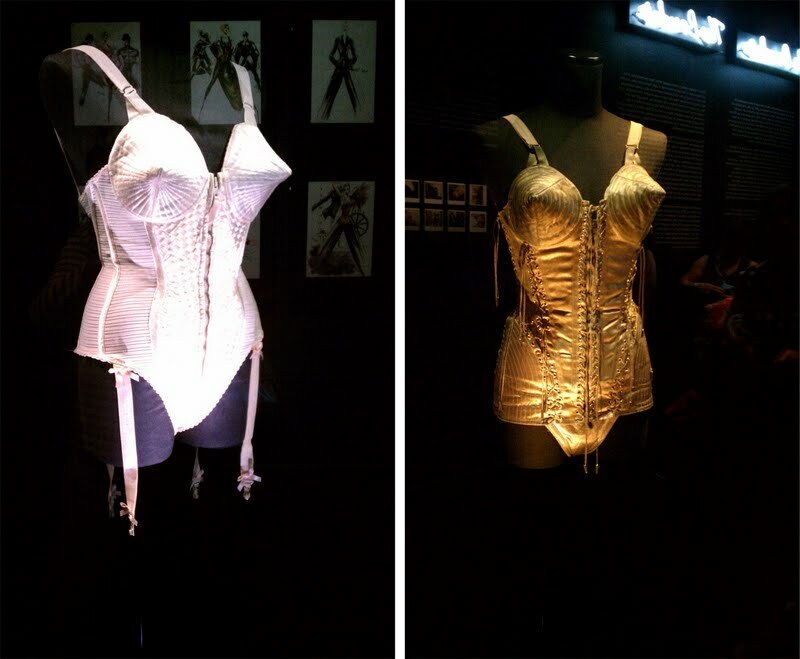 His visions of women (and men) in exaggerated cone bras and his reinterpretations of traditional corsets, epitomized by the costumes of Madonna’s 1990 Blond Ambition Would Tour, captured the Zeitgeist of the 1990s, with its changing attitudes towards gender roles, fashion, sexuality, and society in general. 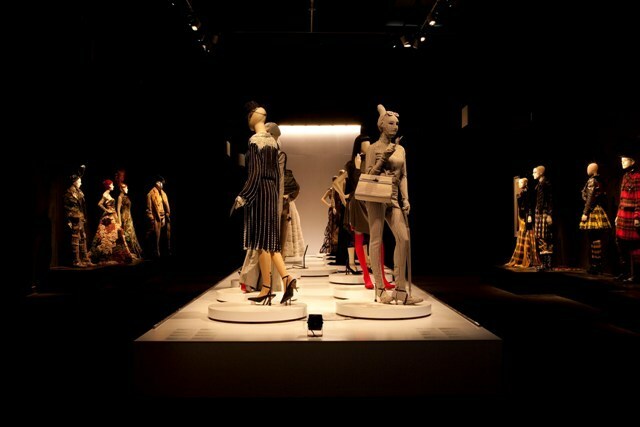 From June 17 until October 2, 2011, the Montréal Musée des Beaux-Arts is showing The Fashion World of Jean Paul Gaultier: From the Sidewalk to the Catwalk, featuring more than 140 pieces from over 35 years of Gaultier’s fashion collections. The curator Thierry-Maxime Loriot (34), a former model, joined the museum three years ago after studying art history at the Université de Montréal. 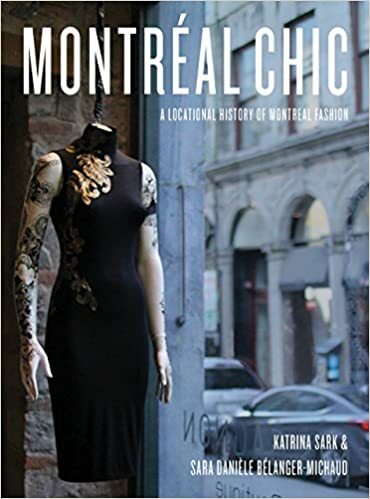 The installation is Montreal’s third time of showcasing fashion in museums, after the 2008 Yves Saint Laurent retrospective (which opened days before the designer’s death) and the 2010 Denis Gagnon exhibition. 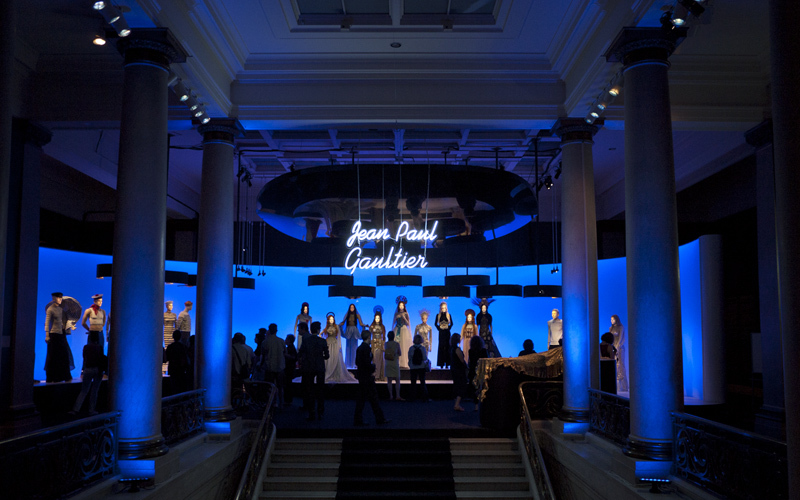 Rather than conceptualizing the installation as a retrospective (which often marks the end of a fashion career), or displaying a brand-funded exhibition (like the Dior show at the Pushkin Museum in Moscow), which borders on an advertising campaign, the Montreal museum director Nathalie Bondil ensured that the Gaultier installation was fully funded by the museum, and presented a celebration of Gaultier’s vision and craft. 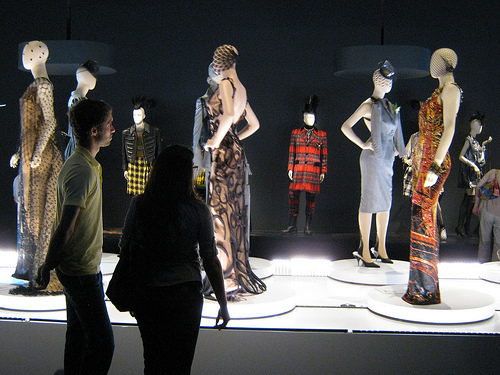 Along with the unprecedented international press attention, cultural events and celebrations that accompanied the opening, and the flood of international visitors this summer, the installation catapulted Montréal’s Musée des Beaux-Arts into the leading ranks of fashion exhibiting institutions (like the Victoria and Albert Museum in London, and MOMA in New York), all of which are in the process of re-constructing and re-conceptualizing a new era of fashion displayed in museums. 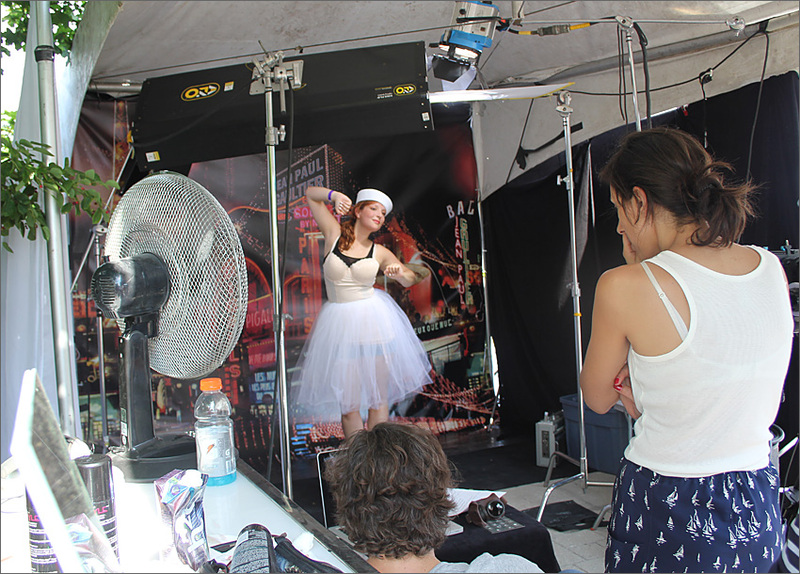 The innovative feature of the exhibition are mannequins whose faces are brought to life by video. This very special technique of projecting video onto a three‐dimensional mask combines technology and craft, with the actor’s own video image projected onto his or her sculpted head. 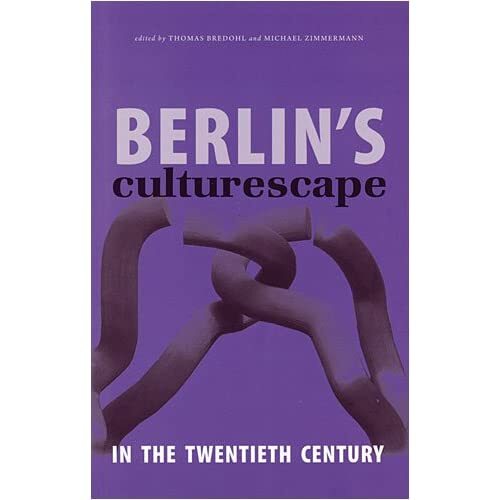 The technique was developed more than fifteen years ago by Denis Marleau with UBU, his Montreal theatre company. For this project, initiated by the Montreal Museum of Fine Arts, Marleau, Stéphanie Jasmin and their team created the mannequins, whose quirky, poetic or joyful presence captures the spirit of installation art. According to Gaultier, “to conform is to give in.” How can we fight the uniformity of the masses? How can we tweak the sexual, aesthetic, ethnic and religious codes that determine social conventions? For it is difficult to become authentically oneself. It is a long process to accept ourselves as we are—a changing being and not a monolith, a personality that is constructing and realizing itself over time, rather than deteriorating or destroying itself. Erasing the boundaries between fashion and art is a project pursued by many designers and curators alike. 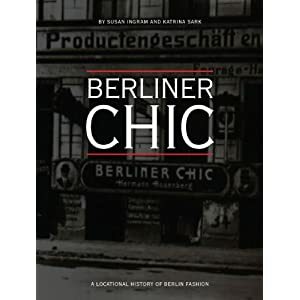 Andy Warhol remarked: “I think the way people dress today is a form of artistic expression. Saint Laurent, for instance, has made great art. Art lies in the way the whole outfit is put together. 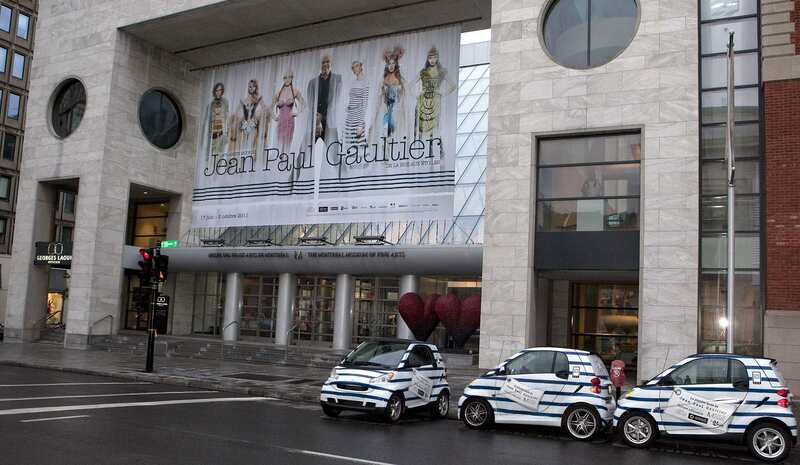 Take Jean Paul Gaultier. What he does is really art.” (Mondo Uomo, 1984). Fashion photography is also a major focus of attention, thanks to loans of, in many cases, never‐before‐seen prints from contemporary photographers and renowned contemporary artists (Andy Warhol, Cindy Sherman, Erwin Wurm, David LaChapelle, Richard Avedon, Mario Testino, Steven Meisel, Steven Klein, Mert Alas & Marcus Piggott, Pierre et Gilles, Inez van Lamsweerde & Vinoodh Matadin, Paolo Roversi and Robert Doisneau…). The many artistic collaborations that have characterized Gaultier’s world are examined: in film (Pedro Almodóvar, Peter Greenaway, Luc Besson, Marc Caro and Jean‐Pierre Jeunet) and contemporary dance (Angelin Preljocaj, Régine Chopinot and Maurice Béjart), not to mention the world of popular music, in France (Yvette Horner and Mylène Farmer…) and on the international scene (Kylie Minogue and especially Madonna, whose friendship with Gaultier has led her to graciously lend two iconic corsets from her 1990 Blond Ambition World Tour). Express what he’s got, oh baby ready or not. Since it was launched in 1993, Classique has been one of the bestselling fragrances in the world. 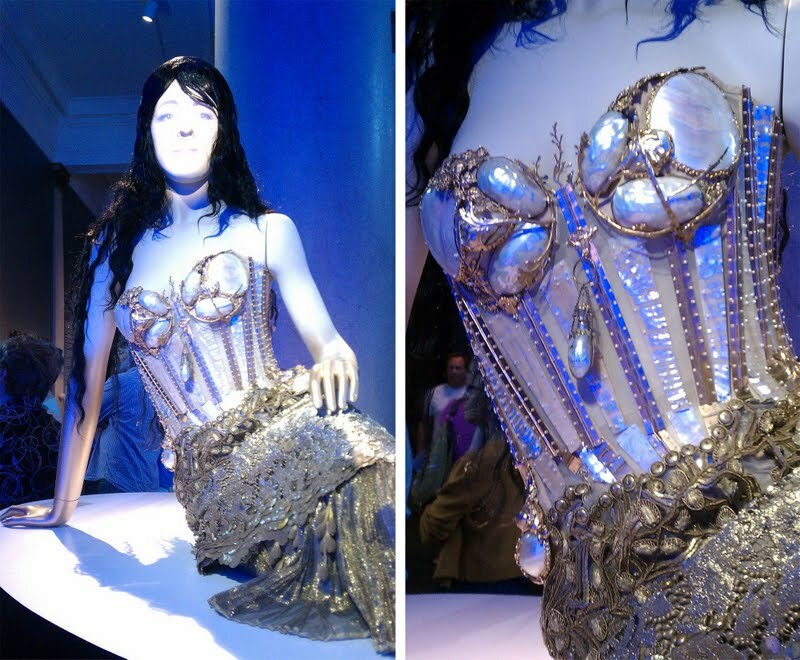 So, what is it about Jean Paul Gaultier that still captures our imagination and touches us in ways that other designers, clothes, fragrances, images, fantasies fail to do? As with all great art and inspiring creations, the artist, designer, filmmaker, musician, etc. communicates our own subconscious desires and un-lived feelings back to us in their own medium. 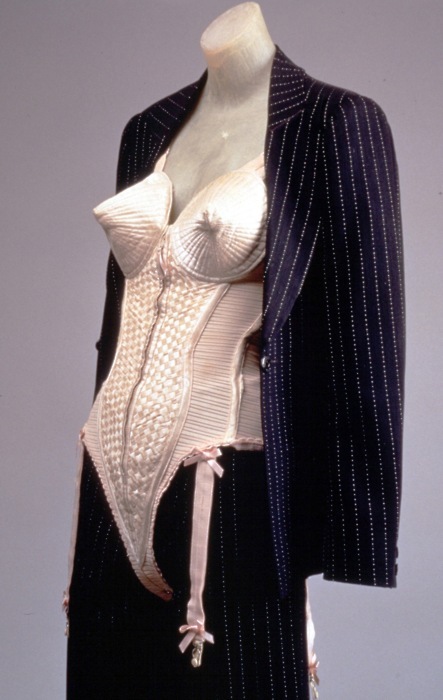 Jean Paul Gaultier not only participated, but made accessible and possible the gender inversion and revolution of the early 1990s (as Madonna famously summed it up: “It doesn’t matter if you’re black or white, if you’re a boy or a girl”). A whole generation of girls and boys was raised to cause “gender trouble” by playfully, aesthetically, or politically rebelling against restricting social norms. 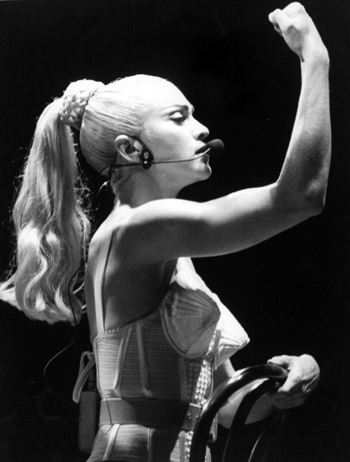 Gaultier provided the aesthetic images and visions, Madonna provided the music and lyrics. 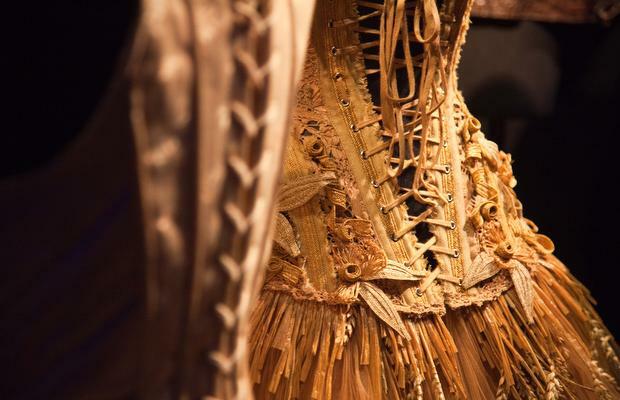 But above all, Gaultier continues to inspire us to live and dream and to “express ourselves” beyond the confines of the possible, established, and acceptable. Following its presentation in Montreal, the exhibition will embark on an international tour, with presentations at the Dallas Museum of Art (November 13, 2011 ‐ February 12, 2012), the Fine Arts Museums of San Francisco, de Young (March 24 ‐ August 19, 2012), the Fundación Mapfre – Instituto de Cultura, Madrid (September 26 – November 18, 2012), and the Kunsthal Rotterdam, the Netherlands (February 9 – May 12, 2013). This entry was posted in Art, Design, Fashion, Montréal, Museums. Bookmark the permalink. Awesome. I would love to see that exhibition. Unfortunately it is in Canada. 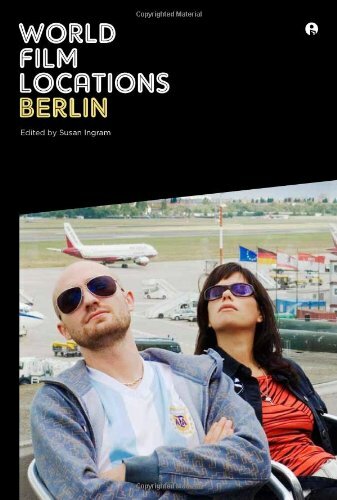 They are not maybe thinking of bringing to BERLIN. great article! thanks for the different pictures. Thank you for sharing this article with us. Mr. Gaultier´s style is truly unique!